People walk up the steps at the Philadelphia Museum of Art. 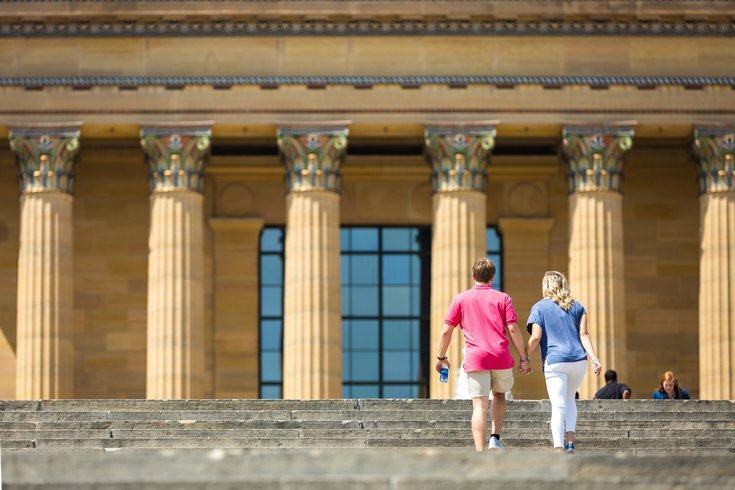 Admission to the Philadelphia Museum of Art, Perelman Building and Rodin Museum will be free all day on Friday, May 18, in honor of International Museum Day. The holiday was created to raise awareness on how important museums are in the development of society. Highlights within the Philadelphia Museum of Art's current exhibits include a collection of British satirical prints, American art from 1910 through 1950 and vintage rock 'n' roll posters. Inside the Perelman Building, visitors can view Jean Shin's large-scale installations made from collected clothing. The Rodin Museum, which is further down the Benjamin Franklin Parkway from the other two museums, contains the largest collection of sculptor Auguste Rodin's works outside Paris. Below are the Friday hours for each museum. If you plan it right, you might be able to check out all three on International Museum Day. • Philadelphia Museum of Art – 10 a.m. to 8:45 p.m.
• Perelman Building – 10 a.m. to 5 p.m.
• Rodin Museum – 10 a.m. to 5 p.m.